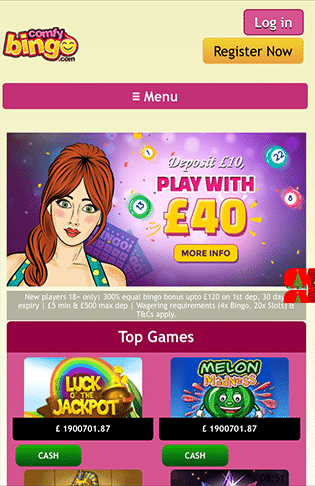 Comfy Bingo Mobile | Get Your £30 Deposit Bonus Here! Comfy Bingo has now closed. This review shall stay archived for historical purposes. Comfy Bingo Mobile provides all new players with access to 7 days of free bingo games, no deposit required. On top of that, decide to make your first deposit today and you will be rewarded with a giant bonus package. The welcome offer includes a 300% first deposit bonus, 150% second deposit bonus and a 100% bonus on your third deposit, making it one of the largest and most rewarding new player packages in the industry. Other perks of registering today at Comfy Bingo include a wide variety of promotions, reload bonuses, huge jackpot prizes and much more. If you decide to join today you will immediately get full access to the standard version and the mobile bingo app. The good news regarding the mobile app is that you will not have to make any form of download at the app store since the site is 100% responsive. What does this mean? Well to put it simply, no matter what device you decide to play from, Comfy Bingo will most likely load fine and allow you to play all of your favourite games. It means you can play on your iPhone, iPad, Android phone, tablet, laptop or PC. The site pretty much works everywhere! Bingo games at Comfy Bingo start from as little as 1p each, plus there is a selection of free bingo games that happen daily, with some nice real money prizes. As for the choice on offer, you will find all the classic game types – 90 ball, 80 ball, 75 ball and even 30 ball speed bingo games. Each room has a jackpot prize which can be won if you get Bingo within a certain number of calls, plus the prizes that are given in each game is fairly decent. It’s not uncommon to find 5p bingo giving away prizes of over £100 or more, so you can rest assured that if you get lucky, you will win a decent prize. 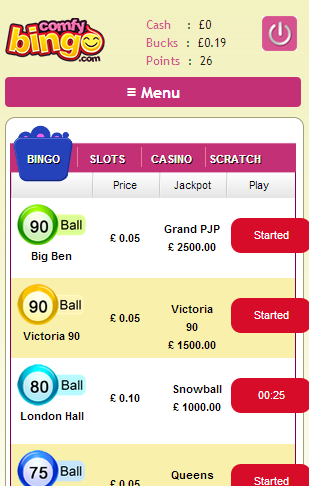 Like any self-respecting bingo site, Comfy Bingo provides a good selection of slots games. At the time of writing, there are more than 160 different games. Each game is unique and from what I can tell, pays out decently. Aside from slots games, there are also a handful of casino games, providing games like Blackjack, Roulette, Jacks or Better and Keno. Likewise, if you are a fan of scratchcards, there are 27 different games to play, which provide instant win prizes. 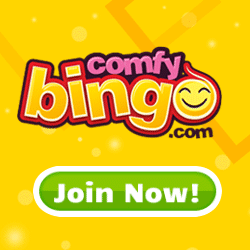 If you are looking for an all around great bingo site to play at, I highly suggest that you give Comfy Bingo a whirl. The best reason to join is obviously for the 7 days of unlimited free bingo tickets, this is available to all new players right away, no deposit is required and you can start playing with your free cards instantly. Aside from that, the mobile bingo version of the site works fantastically, allowing you to play all of your favourite games on whatever mobile device you have.